Born on 5 May 1899 in Coboconk, Ontario - son of Reuben and Jennie Barjarow, Coboconk, Ontario - brother of Private Stanley Elmer Barjarow - attestation form notes trade as painter, single, no current or previous military service, height of 5 feet 4 inches, chest of 34 inches, medium complexion, brown eyes, auburn hair, Methodist. 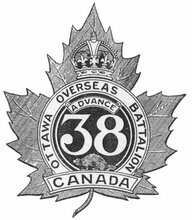 Joined the 109th Canadian Infantry Battalion on 22 November 1915 (number 724520) - taken on the strength of the 38th Battalion in France on 4 or 6 December 1916 - killed in action on 9 April 1917 - name listed on the Vimy Memorial, France. (Updated with a photo of Pte Barjarow's inscription on the Vimy Memorial that I took in August 2012).